The world’s leading iris recognition system from Iris ID becomes even more valuable with TimeReport™ searches, custom reports and data importing simplified by the companion iDataä IrisAccessâ EAC (Entry Access Control) software. The TimeReport intuitive software uses drop-down menus to allow operators to quickly review records by employee name or ID number; by day, week, month or any defined time range; or by absences. Data can be formatted as text or XML files for exporting to spread sheets. 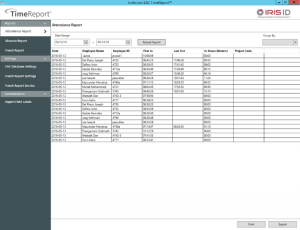 A “punch” option can automatically create reports to share with ERP programs such as payroll. Punch transactions can include any of the collected attributes, including user ID, date/time of punch, collected data such as department, task or assignment or projects or job codes, In/Out, and device identity where the punch originated. Customized reports can also be created in pdf format for printing or sharing via email. Organizations can incorporate their own logos for a customized report. 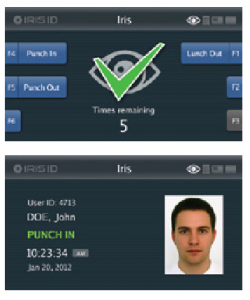 IrisAccess EAC works seamlessly with the Iris ID iCAM 7 Series hardware, as well as with virtually any physical access control system (PACS). The software also supports virtually any card type — PROX, iClass, MiFare, DesFire, PIV, CIV and more. TimeReport allows a centralized management of employees working at multiple locations, and the data necessary for various decision-making rules can be effectively collected and reflected. With Iris ID TimeReport, any business or institution can have the optimal system by connecting to other existing systems, enabling a management innovation that delivers quickly measurable ROI. Create precisely the right report with the flexible TimeReport module. It is fast and easy to create and automate reports to help you track and analyze employee productivity information instantly. Choose the information you want displayed and see the report built on your screen in real time. For more information on the Iris Access EAC or any other Iris ID hardware or software, contact the company at sales@irisid.com or visit the website at https://www.irisid.com/.